"Eyeliner is amazing! I always tell my clients that it is life changing. 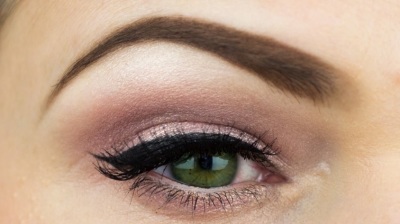 Why we wear eyeliner is to enhance the lash line and give you the look of having thicker, fuller lashes. There are different looks that are possible. I can start off in the lash line then go from there. I generally do a pretty basic line on the bottom, then on the top make the line a little thicker on the ends, then taper it in as we bring it in towards the nose. But what's nice with this application is that we build one the line. My clients have a mirror and if they want it thicker, they just have to tell me. We work on the desired look you are trying to accomplish, together." "This application is amazing for the client that has been penciling her brows on. It is used both to fill in sparce areas in the brows and to give a natural looking brow to someone that has no hair at all. I use a cosmetic tattoo machine. With this machine, you can expect to have a very soft result, which looks more natural than a regular tattoo machine which produces a 'sharpy pen' look. I always start our first application on the more 'conservative side' of color. We can always add more color, if a bolder brow is what you are wanting, but taking away color isn't something we can do." "A full lip color is amazing! The first application gives the lips two shades darker color. Again, I start off on the conservative side. Some clients will take more to the pigment than others. It is easy to add color, but difficult to take away. The first application, you can expect to get a couple shades darker than the natural lip color. If more color is desired, a touch up can be done as many times as you want to achieve the desired shade. I use the example of using nail polish. The first coat of nail polish goes on and each additional coat makes it darker and darker."